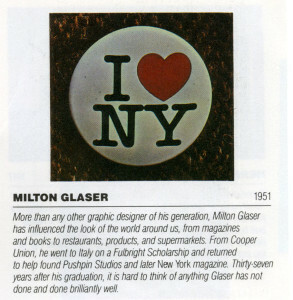 Milton Glaser, A’51, received the 1966 Augustus Saint-Gaudens Award, the 1966 President’s Citation and the 2002 Urban Visionaries Award. He is among the most celebrated graphic designers in the United States. Following graduation from The Cooper Union, he received a Fulbright Scholarship and studied at the Academy of Fine Arts in Bologna, Italy, under Giorgio Morandi. In 1954, he co-founded Push Pin Studios with fellow CU graduates Seymour Chwast A’51, Reynold Ruffins A’51 and Simms Taback A’53. In 1968, he co-founded New York magazine with Clay Felker, serving as President and Design Director until 1977. He established his own design firm, Milton Glaser, Inc., in 1974, and WBMG, a publication design firm with Walter Bernard, in 1983. Glaser designed one of the most recognizable logos in history, “I Heart NY,” commissioned by the state of New York in 1976. His work is in the collections of the MoMA, the Israel Museum. Milton Glaser was inducted into The Cooper Union Hall of Fame in 2009. This entry was tagged Graphic Designer, I Heart NY, Milton Glaser, Push Pin Studios. Bookmark the permalink.